When I was a little kid, I was so excited each Christmas morning to discover presents under the tree from Santa—it said so right there on the tag! He wasn’t the only one leaving me gifts, for I also got ones from Mrs. Claus, all the reindeer, Frosty the Snowman, and many of their friends. But it didn’t stop there. Peppered in between the holiday usuals were tags bearing the names of my favorite cartoon characters, actors, and stuffed animals. Even after I stopped believing in the big guy, my mom continued to slip something under the tree from my celebrity crushes to the singers of songs I played on repeat via mix tape. Sure, this might have simply seemed like a silly, fun thing to do, but it made me feel seen, known, and understood. So I carried on the tradition when I became a mom, myself. Here’s thing about kids: they are always changing their minds. What they love to watch, listen to, play with, experience. It’s hard to keep up, but we do. We’re the parents, so we stay tuned in to what’s making them happy: the people, characters, and content. Normally this gets filed away under Okay, That’s Fine and left alone, or Um, No That Is Totally Inappropriate and an intervention takes place. 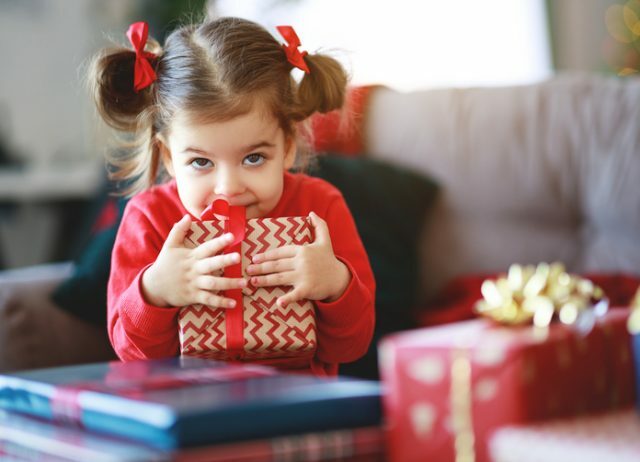 By giving kids gifts from who or what is important to them—whether or not we’re interested in the same things—we are showing them that we’re listening. We get them. Isn’t that all we want as kids, to feel like we matter enough to pay attention to? I remember how my own mom would somehow know which movie star I had a crush on, even though OMG NO WAY did I ever talk to her about my crushes (like, gag me with a spoon at the thought!). Without ever making a big deal about it, she let me know she knew. And that was enough. I can even say that it’s still enough four decades later, for my mom continues to sneak in a gift for me from someone or something that shows she’s still paying attention to this day. Once my kids were old enough to form their own opinions on what to binge-watch, I, too, included gifts under the tree from everyone from Santa to the character on their favorite TV show that made them laugh the most or the YouTube star they couldn’t get enough of. Any chance I can get to let them know I am here, I am a constant in their lives who sees them, knows them, understands them? I’m going to take it. When people talk about the holiday season, they regularly refer to the magic that happens. While twinkling lights and spying elves and a jolly dude who sneaks down chimneys are all pretty great, I think the best magic we can create is that which makes our kids feel accepted for who they are and secure that someone back home is ready to learn what is important to them as it shifts over time. Yes, even when they’re in their forties with kids of their own.